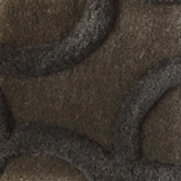 Nanimarquina, Ovo carpet grey: There are instinctive gestures that are the extension of a thought, like when you draw concentric lines, the number eight or endless circles sketched on a paper when talking on the phone. Nanimarquina, Ovo carpet grey: There are instinctive gestures that are the extension of a thought, like when you draw concentric lines, the number eight or endless circles sketched on a paper when talking on the phone. You can always recognise in them the thread of a conversation, the unconscious expression of ideas, the pleasing sensation of relaxation and abandonment that accompanies some conversations. This collection wants to transfer this emotion, letting those traces overlap on a smooth surface, creating an energetic, and at the same time smooth, effect. Let yourself get carried away. Ideal for the dining room.